Held in stock and delivered within 2 working days. Folds in seconds for transport or storage. FREE premium wheelchair cushion with every wheelchair sold. Seat width 18″ max user weight 17st. Folded measurements length 61 cm, width 21 cm, height 76 cm. Built in carry handles Super lightweight under 7 KG (net carry weight foot rests removed) Flip up removable footrests Fold down back rest Sturdy alloy construction Handle bar brakes Parking brakes Seat belt Puncture proof tyres Super comfy padded seat Max user weight 16st Internal seat width 46cm Overall measurements (fully open) height 94 cm, width 59cm, length 92cm Seat height from floor 49cm Folded measurements length 61cms, width 21 cms, height 76 cms. A very smart walking stick approx 400g, height adjustable with rubber tip. Smart handle in different colours and patterns. 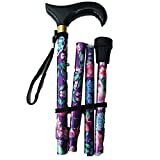 Useful stick, lightweight, folding with an outdoor carry pouch with handle.